This was at the coastal settlement of Vipingo in July this year. Shariani primary school lies off the B8 road that joins Mombasa town to Kilifi town. Most of the school children live around the school and can walk to the beach in less than ten minutes. The project was organised through the joint collaboration of students from Ashwell Residence in London and Fanusi Residence in Kenya. The team of eight British students attend various universities in London while the nine Kenyans were drawn mainly from the University of Nairobi. Both teams had to work long and hard to prepare for the teaching project. The Kenyans also served as translators for the Britons because Swahili is the language often used in that area. Jihye is a trained teacher who is originally from South Korea and is currently finishing her masters degree in education in London. She gave great advice on how to prepare fun and lively classes for the children as she has had previous experience coming up with such programs. Her team was therefore well equipped even buying a monopoly board so that they could use the fake currency notes of the board game so as to teach the children how to count money. “It was a really unforgettable experience. During our project, many people helped us - from the fundraising to the fieldwork. I have learnt we cannot do anything without the cooperation of the locals. Shariani students were amazing. They are tolerant and polite. Even though they struggle with their lack of resources, they will develop their abilities with education. Education is the key solution to overcome the poverty and to lead sustainable lives,” said Jihye. The Kenyans in the group worked mainly with standard three and four students teaching Maths, English, Creative Arts and Physical Education (P.E), while the foreigners focused on the kindergarten children. Classes were held in the morning while remedial and other sessions were in the afternoon. Creative arts proved to be very engaging for the class fours who are normally a rowdy lot, but sat quietly working on their projects and asked to have their artwork hung up on the noticeboard at the back of the classroom. 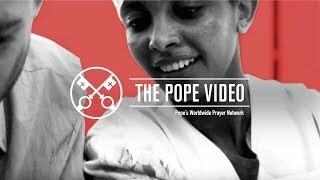 Bettina, a law student at the University of Nairobi also found the experience fascinating. “It was amazing all through. From the team, to the teachers and of course the students. The children have so much hope amidst so much adversity. Nothing dims their light. Trying to understand a child involves thinking like them, playing their games and speaking their language. The experience took me back to my childhood, literally. It is those once in a lifetime experiences that you never forget. Asante Shariani….,” she said. It was also interesting to see the school feeding program at work as the kindergarten children get porridge at break time while the other school children are fed school lunch. The children take turns to bring wood to light the fire used to cook these meals. 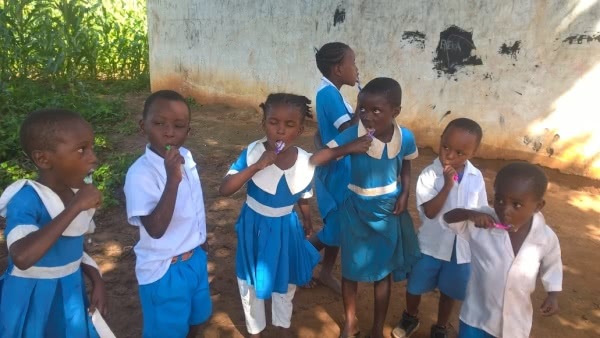 The highlight of the kindergarten program was teaching them how to brush their teeth. Children from the area normally use twigs from the local ‘mswaki’ tree and ash to do this basic grooming task. There are studies that show that this practice is as effective as using a toothbrush and toothpaste and most children in the area have very white healthy teeth. However, not all mothers teach their children how do this at an early age with some leaving it for later. Each child got a toothbrush during the session and was shown how to clean their teeth. Barbara is a Brazilian living and studying in London. In her view, she was the one learning from the kindergarten children. “I was really impressed by the children -- though their resources are so few, they were always generous and honest with any material we would give them, making sure they would always be returned to us by the end of each class. Their openness to us and their willingness to help also struck me. I often felt like I was the one learning,” she said. Before the project started, both teams held some fundraising initiatives to raise funds so as to give the school 20 desks as some of the children are sometimes forced to sit on the floor or squeeze at one desk. During the project, a carpenter came in and made the desks which were handed over to the school at the end of the project. To show their gratitude, the school choir presented a dance which they were to present at the regional music festivals. The foreign students also took time to imbibe a little bit of the local culture. This happened from the very beginning as the British got into a ‘matatu’ for the first time in Nairobi to travel to the train terminal and were bedazzled by this mode of travel with bright lights and the in-house entertainment. 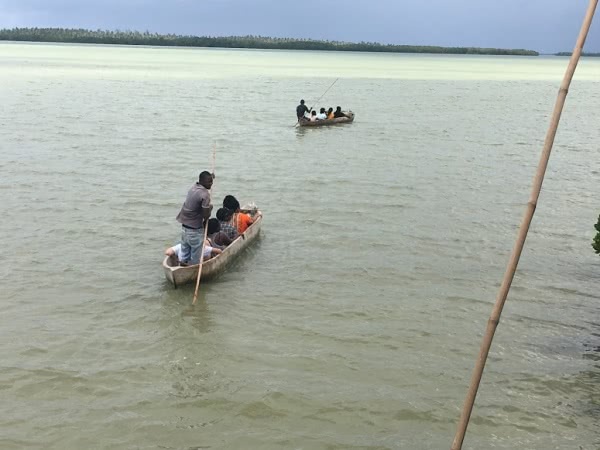 But they also went to see a local acrobatic show in the village, visited Mida Creek and took a boat ride to Waka Waka island where they sampled local swahili seafood. By the time they left to go back home, they had even picked up useful Swahili expressions to get by. 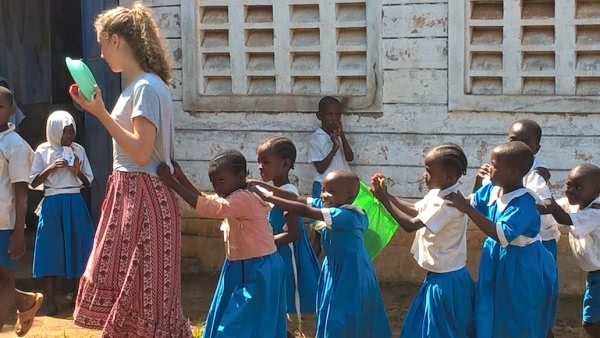 “Participating in this three week volunteering activity in Kenya was certainly a life-changing experience. The welcoming and smiling faces of the very happy children from Shariani showed how rewarding it is to serve and contribute, even if just a little, to the world’s education. We taught them English, Science and Maths but they taught us the true wisdom of life,” said Luiza, another volunteer from Ashwell House.